AngularJS Material UI is not providing any Accordion functionality script. So here I made some accordion with UI elements provided in Material UI. Accordion is consists of headers and content. Observe above image. HOLDEN, FORD, TOYOTA are headers here. Whenever user clicks on plus icon, the content will be displayed and plus icon will be minus. Observe below JSON of header and body data. 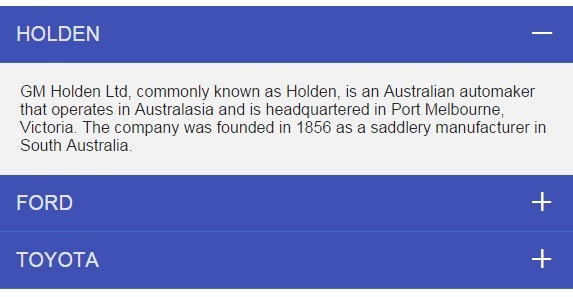 "content" : "GM Holden Ltd, commonly known as Holden, is an Australian automaker that operates in Australasia and is headquartered in Port Melbourne, Victoria. The company was founded in 1856 as a saddlery manufacturer in South Australia." "content" : "The Ford Motor Company (commonly referred to as simply Ford) is an American multinational automaker headquartered in Dearborn, Michigan, a suburb of Detroit. It was founded by Henry Ford and incorporated on June 16, 1903." "content" : "Toyota Motor Corporation is a Japanese automotive manufacturer which was founded by Kiichiro Toyoda in 1937 as a spinoff from his father's company Toyota Industries, which is currently headquartered in Toyota, Aichi Prefecture, Japan." Hi..Thanks for this post!...Could you let me know how to close the accordian when user clicks outside of it? I want to call certain method on click of header and want to show arrow icons which are basically md-icons how shd I proceed? How can i add html tags in content part?